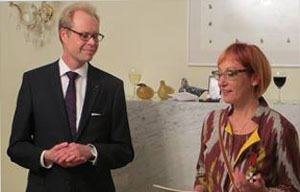 Congratulations to our partner Iluta Lace from the Marta Resource Centre for Women, who has been awarded the Finnish decoration Knight of the Order of the Lion of Finland. Iluta is a long-time advocate of women’s rights in Latvia, and she has been a key advocate in the process leading to the adoption of the legislative amendments which help protect victims of domestic violence in Latvia. As the Embassy of Finland, we applaud Iluta’s determined energy and courage in promoting the rights of all women.